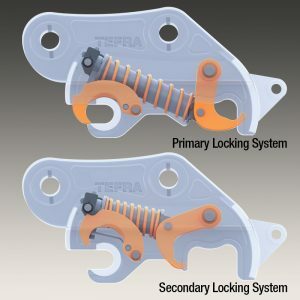 The dual safety features of the TEFRA Auto Coupler are unique within the attachment industry. The TEFRA Auto Coupler allows you to quickly and safely change attachments, creating a very versatile base machine and more productive work environment. The coupler features a patented safety mechanism that eliminates the need for manual locking pins found on competitive couplers. The primary safety system consists of a uniquely designed set of hooks powered by a single cylinder and high specification hydraulic controls that lock the attachment securely into place. Our secondary locking system is an active protection system (APS), consisting of two separate powerful springs (coil and leaf) that apply pressure to the hooks to ensure attachment retention at all times. A unique, fully patented major safety feature of the TEFRA Coupler. The Smart Valve is a simple, patented, totally effective solution ensuring that the attachment and release sequence cannot be started until the Coupler is orientated towards the operator and close to the ground. This eliminates the possibility of an unsafe situation occurring. The Smart Valve’s compact design means it can be totally enclosed within the hydraulic cylinder at the centre of the Coupler; this protected position means it cannot be contaminated. It requires no routine maintenance and works in conjunction with other warning systems such as audible indicators to ensure a safe and easy operation.